In the context of Barack Obama's 2016 visit to Japan, this image was made. 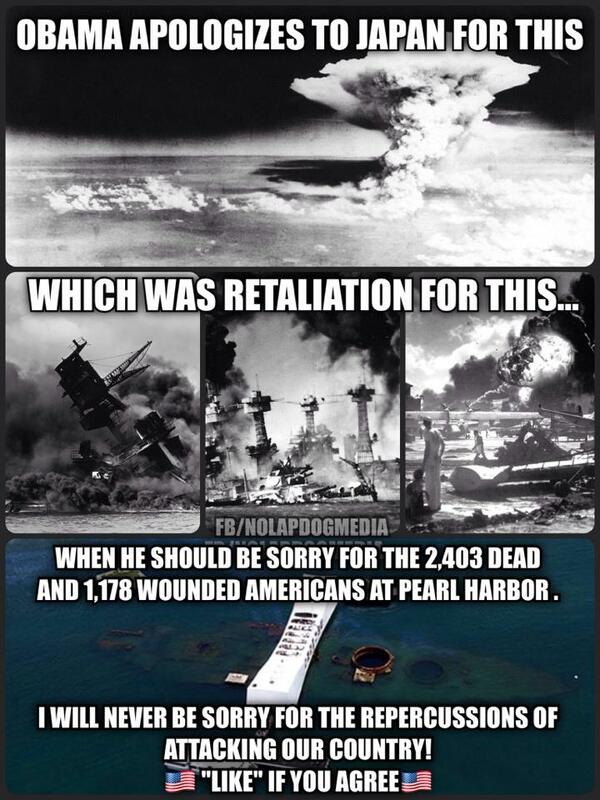 when he should be sorry for the 2,403 dead and 1,178 wounded of [sic] attacking our country! Did he apologize for the bombing? If not, did he do something that might be reasonably interpreted as apologizing? He laid a wreath, mourned the dead, spoke about a moral duty to prevent the horrors of war, but didn't apologise, didn't separate the nuclear attacks from the other horrors of war, and didn't express any view on whether the use of nuclear weapons at that moment in history was right or wrong. Barack Obama said on Sunday his visit to Hiroshima, the first city to suffer an atomic bombing, would emphasize friendly ties between former enemies. But the US president reiterated he would not apologize for the devastating attack. ...“It’s important to recognize that in the midst of war, leaders make all kinds of decisions, it’s a job of historians to ask questions and examine them,” Obama said. Snopes have looked into the claim that he apologised, and found it to be false. The Atlantic have published an analysis piece around why it is common in diplomacy to stop short of an apology like this, and why the line is drawn where it is. When Barack Obama goes to Hiroshima.., he will not apologize on behalf of his country for carrying out that strike 71 years ago. He will neither question the decision to drop bombs on two Japanese cities, nor dwell on its results: the deaths of more than 200,000 people and the dawn of the atomic age. But he will affirm America’s “moral responsibility,” as the only nation to have used nuclear weapons, to prevent their future use. He will recognize the painful past, but he won’t revisit it. When it’s all over, we still won’t know whether or not he thinks there’s something about the atomic bombings to be sorry for. We come to ponder a terrible force unleashed in a not-so-distant past. We come to mourn the dead, including over 100,000 Japanese men, women and children, thousands of Koreans, a dozen Americans held prisoner. That is why we come to this place. ... We listen to a silent cry. We remember all the innocents killed across the arc of that terrible war and the wars that came before and the wars that would follow... we have a shared responsibility to look directly into the eye of history and ask what we must do differently to curb such suffering again. Some day, the voices of the hibakusha [nuclear attack survivors] will no longer be with us to bear witness. But the memory of the morning of Aug. 6, 1945, must never fade. And since that fateful day, we have made choices that give us hope... An international community established institutions and treaties that work to avoid war and aspire to restrict and roll back and ultimately eliminate the existence of nuclear weapons... among those nations like my own that hold nuclear stockpiles, we must have the courage to escape the logic of fear and pursue a world without them. In the span of a few years, some 60 million people would die. Men, women, children, no different than us. Shot, beaten, marched, bombed, jailed, starved, gassed to death... Yet in the image of a mushroom cloud that rose into these skies, we are most starkly reminded of humanity’s core contradiction. If not, did he do something that might be reasonably interpreted as apologizing? From Obama’s origami cranes he left behind touches many hearts, the brother of Sadako Sasaki, who died of leukemia most likely caused by the atomic bombing of Hiroshima, interpreted Obama's hand-crafted origami cranes given to the Hiroshima Peace Museum as an apology. Sasaki’s 74-year-old brother, Masahiro, said on May 28 he was deeply moved by the president taking an interest in his sister’s origami cranes. “I took his gesture as his apology, strong determination to restore peace and warm, generous heart,” he said. "A sitting U.S. president visiting Hiroshima is just the first step. We're still 10 years from the possibility of a president issuing an apology." "Japan has to apologize for Pearl Harbor, too, if we're going to say the U.S. must apologize ... That's not possible, given the countries' current situations. In America, people say the war ended early because they dropped the atomic bomb. If a president apologized for this, it would raise hell in the U.S.
"We can't tell North Korea not to have nukes when the U.S. has them, but the U.S. developed them first ... It's not possible to get rid of nuclear weapons when they're being used as deterrence." To study this, we performed a series of surveys on a nation-wide Japanese sample of about 1,000 people, and on a similar number of people currently living in Hiroshima. We asked if they support the visit itself, if they see sincerity in the visit, and if they see the visit as a sort of apology (even though the White House denies it). On the question which asks whether they consider the visit to be “a sort of apology,” their answer is “Yes”. We believe this is the most important finding of the survey: that the visit is considered as a “non-apology apology” in both Hiroshima and national samples even though the White House states that President Obama will not revisit the decision to use the atomic bomb and there is no intention to make an apology. For the national sample, 77.3 per cent see Obama’s visit as a sort of apology, and for Hiroshima, the number is 85.6 percent. As Figure 1 shows, the national and Hiroshima samples are statistically different – more people in Hiroshima see it as an implicit apology than the national average. Not the answer you're looking for? Browse other questions tagged united-states politics japan hiroshima-nagasaki . Did Taro Aso say that Japan should emulate the Nazis in amending the constitution? Did Hiroshima change the layout of its streets subsequent to the war?